An ancient armored door preserves the patrimony of auteur wines and prestigious vintages in a real “Wine Caveau” while from the “Infernotto“, the ancient room with the barrel vault that separates the cellar from the restaurant, this treasure can be admired through the large windows protected by strong 17th century railings, recovered from an old prison. The cellar was built under the courtyard, with cross vaults in old bricks and a floor of large natural split stone slabs. Two different areas, dedicated to white and red wines, are separated by a large rusty iron glass door. The furniture has been custom made, alternating the light wood of the wine boxes with the rusty iron. The winery includes a tasting area, with a large table made of an eighteenth-century oak plank resting on two old barrels and an old wash-house. 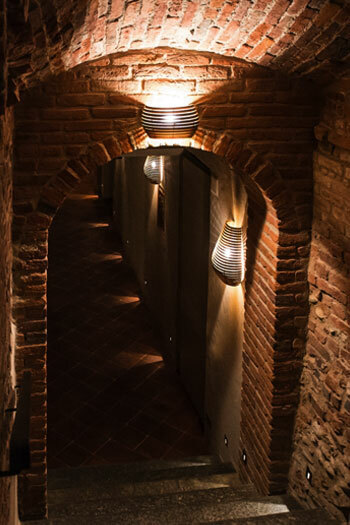 Trying the magic of tasting a glass of Barolo in a real cellar that smells of Langa and history, where a sophisticated equipment guarantees the microclimate necessary for the maintenance of important wines that lend themselves to aging. Meeting in an evocative setting for standing aperitifs or for a “welcome drink” before an event. 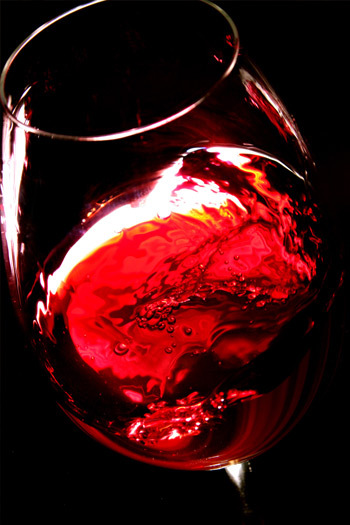 Participating in tasting courses or team-building sessions, where conviviality and competitions to discover the tastes and aromas of wines encourage team involvement and spirit. 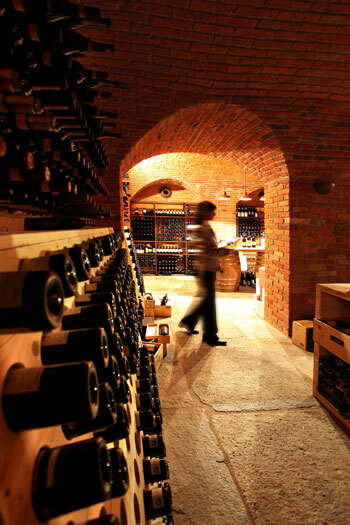 The rich cellar holds almost 5,000 bottles that allow you to taste white, red, sparkling and raisin wines. 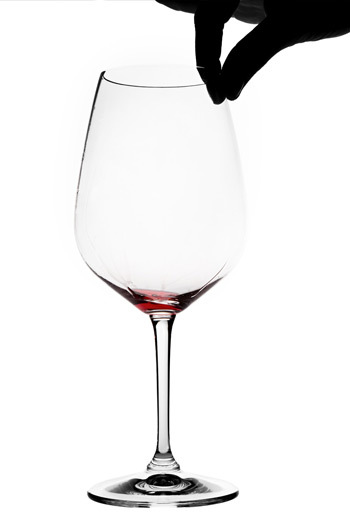 Among the 500 different labels, there is a wide selection of Piedmontese red wines, starting from Baroli and Barbareschi, but there is ample space for wines from other Italian regions as well as for foreign wines, where the French ones are king. 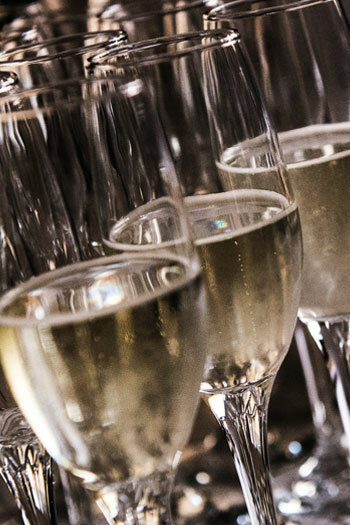 In particular, great attention is given to Champagne and white wines from Burgundy. 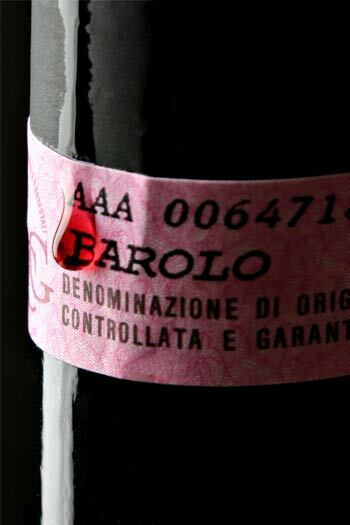 The offer is completed by a rich selection of large formats, magnums including Baroli, Barbareschi, and Champagne.